Curiosity is now officially coloring outside the lines. The rover recently drove out of the area NASA had initially demarcated as safe terrain for its 2012 landing in Gale Crater. The landing ellipse established by NASA measured approximately four miles wide and 12 miles long (7 x 20 km). 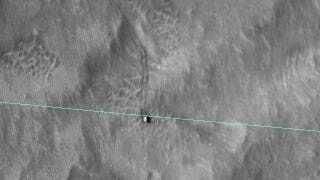 THe HiRISE camera on NASA's Mars Reconnaissance Orbiter took a shot of the rover as it drove across the boundary.